Hospitality: An Introduction is systemically organized for introductory students. This long-standing, successful book introduces many of the “must know” topics important to hospitality within a traditional business framework. It also provides readers with a snapshot of a wide variety of industry career paths, an attribute not found in other books. The goal is to provide a broad-brush survey approach to the hospitality industry, while offering the information needed to help students proceed into more advanced courses and readings. This text explores the topics that separate hospitality from other fields of study. Hospitality Industry Foundations – provides the “big picture” of the industry. It gives an introduction, along with the history, future trends, and emphasis on service excellence. Hospitality Management – explores the ‘nuts and bolts’ of how hospitality businesses operate. It introduces many of the on-site disciplines that are an integral part of the daily operations in hotels, restaurants, clubs, events, and other hospitality businesses. Traditional Hospitality Careers – discusses the fundamental or traditional hospitality career paths. This section highlights the major areas typically associated with the hospitality industry: from hotels, restaurants, and beverage to clubs and events. Optional Readings: Specialized Hospitality Careers – introduces students to some of the many possibilities for fascinating careers in the industry, including theme parks, casinos, cruise ships, and more! 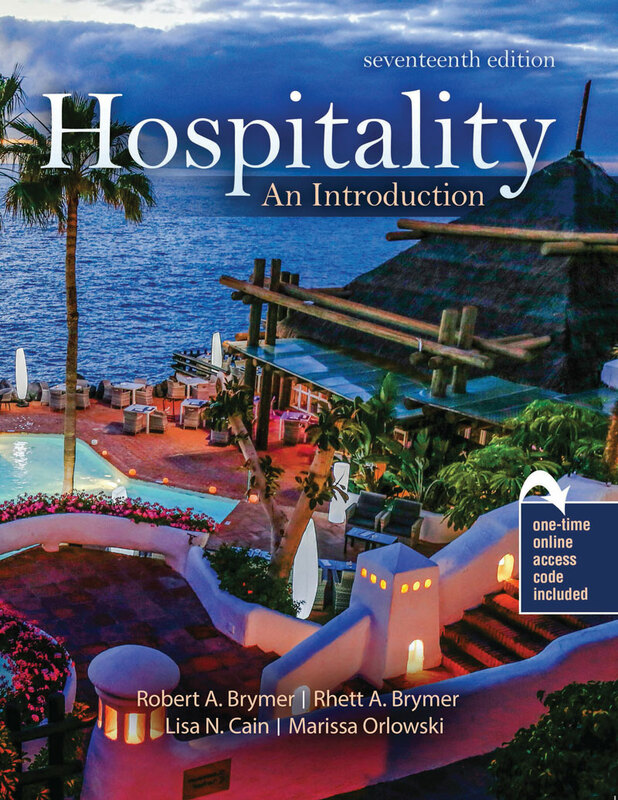 Hospitality: An Introduction offers the reader a broad introductory perspective that can stir-up excitement while creating a thirst for more information in specific career niches. This text provides the basics of the world of hospitality, and most importantly, where a student might fit in. This book is an essential read for any student interested in the fascinating hospitality industry. This edition includes access to an ancillary website that contains resources for students and instructors. Who is Involved in Guest Service? Is there A Difference Between Theme Parks and Amusement Parks? Dr. Brymer has over 30 years of management, consulting, and education experience in the hotel industry. He has held management and supervisory positions with Hyatt Hotels, Westin Hotels, and Hospitality Management Corporation. In 2000, while on sabbatical from Florida State University, he worked for several months in daily operations at The Ritz-Carlton Hotel, in Sydney, Australia. His management seminars have been presented for more than 7000 managers in the hotel industry, including Four Seasons, Walt Disney World, Ritz-Carlton, Marriott, Hyatt, Hilton, Westin, Inter-Continental, and many five-star independent hotels and resorts. Dr. Brymer earned his doctorate in Psychology from The University of Denver, where he specialized in executive and management psychology. He has an M.B.A. in Hotel, Restaurant, and Institutional Management from Michigan State University and a B.S.B.A. in Hotel and Restaurant Management from The University of Denver. He is one of the hotel industry's leading authorities in managerial and organizational psychology, and has conducted research in the areas of executive personality, leadership behavior, ethics, service excellence, and managerial stress. Rhett Brymer is the John Mee Endowed Assistant Professor of Management at the Farmer School of Business at Miami University in Oxford, Ohio. He completed his Ph.D. from Texas A&M University in the field of business strategy, his M.S. in instructional systems design and M.B.A. from Florida State University, and B.A. in chemistry from Kenyon College. His general research interest is in strategic human capital, specifically how firms manage their recruiting pipelines, their turnover, and their incentives for performance. Dr. Brymer has industry interests in beverage operations and teaches a course on the craft brewing industry. Prior to academia, he worked in hospitality operations in full and quick service restaurants and in catering/special events. Dr. Brymer also worked as a chemist in biotechnology, and as a human capital consultant. He has published in the Journal of Management, Strategic Organization, Academy of Management Education and Learning, and in MIT Sloan Sports Analytics, among other outlets. Dr. Lisa Cain is an Assistant Professor in Florida International University’s Chaplin School of Hospitality and Tourism Management. She earned her PhD from the University of Nevada, Las Vegas, in Hospitality Administration, master’s degree from Florida International University in Hospitality Management, and bachelor’s degree from Smith College in English Language and Literature. She also spent a year studying at Oxford University in England. She currently teaches marketing management, and globalization and competitive methods in the hospitality industry and has previously taught organizational behavior; restaurant management and operations; and leadership, management, and ethics. Dr. Cain’s research interests fall within the broad topics of organizational behavior and marketing with an emphasis on understanding internal and external customer behavior. Specifically, she has studied work–life balance for executive chefs, substance abuse among hospitality workers, and loyalty in the hospitality industry. She continues to develop research in these topics as well as in the emerging topics of robotics and co-creation in hospitality. Marissa Orlowski, PhD, is an Assistant Professor in the Rosen College of Hospitality Management at the University of Central Florida, where she also earned her PhD in Hospitality Management and a Doctoral Certificate in Advanced Quantitative Methodologies in Educational and Human Sciences. She completed her MBA with an emphasis in Management from the University of Colorado at Colorado Springs and her bachelor’s degree in Hospitality Management from Michigan State University. Dr. Orlowski’s academic career is preceded by over 15 years of restaurant, bar, and catering management experience in the hospitality industry with prominent brands such as Walt Disney World Parks & Resorts and The Cheesecake Factory, and she remains connected to the industry through continued involvement with professional associations such as the U.S. Bartender’s Guild, where she is active at both the local and national level. Dr. Orlowski currently teaches Beverage Management and Fine Spirits Management at the undergraduate level, and her research interests are also primarily focused on beverage and alcohol consumption, blending both consumer behavior and managerial/operational perspectives. She has published in various highly-ranked journals, including the International Journal of Hospitality Management, the International Journal of Contemporary Hospitality Management, and the Journal of Service Management, presented at numerous inter-national conferences, and serves as the Assistant Editor for the International Journal of Contemporary Hospitality Management.